The Spider-Man reboot is currently casting, and director Marc Webb is on record as going for an actor much lower profile than Tobey Maguire to take the titular, masked role. Sci-fi blog io9 suggested that the next Spidey be a non-caucasian. Some commenters threw out the name Donald Glover from the TV show Community and the comedy troupe Derrick Comedy, perhaps in part because Glover jokingly tweeted that he wouldn’t fight a movement to get him the part a few months earlier. Glover happened across the article and the comment, and he tweeted again that he would love to be considered for the part. He started to push the twitter tag “#donald4spiderman” and it went mildly viral. After organizing two twitter-bombs to get the tag as a trending topic (though he didn’t reach his goal of cracking the worldwide top ten, #donald4spiderman peaked at #3 in the US and #1 in Chicago), the blogs are ablaze with discussion about whether such a casting — and, more generally, a non-white Peter Parker — would be a good thing. He’s focused on funny roles so far in his career, but his characters have occasionally had moments of drama. Glover’s always nailed them. Plus, he’s an incredibly gifted physical actor. Unlike Tobey Maguire, who always felt a bit stiff in his set pieces, Glover would be a natural with the running and jumping and flying. The awful fan reaction to Spider-Man 3 coupled with the gushing love for The Dark Knight has rendered the Spider-Man franchise virtually irrelevant. Coming back with smaller names, a smaller budget, and a director best known for a Zooey Deschanel film wouldn’t help; there’s almost no way it will gain any box office traction… unless, of course, you give the public a reason for a reboot. For example, changing the race of the character. Think of some of the most memorable blockbuster roles of the past few years: Downey in Iron Man, Rourke in The Wrestler, Bridges in Crazy Heart, etc. Most of them have had some sort of connection between actor and character. Glover’s connection to Parker is that he, too, is a nerd from a New York. It’s not particularly poignant, but these little touches matter. There’s nothing distinctly white about Spider-Man, aside from the fact that he’s always been white. In fact, there’s nothing about Spider-Man that has any notable ethnic or racial element to it. He’s not defined by his race or his background. Basically, Glover’s blackness does nothing to contradict or affect his legitimacy as Parker. Unlike Superman and Captain America, Spider-Man isn’t much of a patriotic symbol. If anything, he’s symbolic of the dismissed and struggling lower class being more powerful and meaningful than commonly recognized. That’s why I think it makes good sense to have a minority Spidey: Many of the character’s underlying themes match the traditional challenges of upward mobility for urban, minority youth. He’s not quite Will Smith or Denzel Washington, but he’s got that inherent likability and energy about him usually reserved for much more polished stars. Throw in his good looks, his popularity with the people he works with, his obvious passion for entertaining (he’s also a rapper), and you have someone who could be headlining movies for decades to come, provided his acting chops grow as his resume does. Glover not only works with a comedy troupe, he does a lot of non-mainstream standup and improv. He’s a part of a network of entertainers — starting with his comedy troupe — that are ripe with talent. A major film studio tapping into that network could earn great dividends and acquire a large pool of new talent. This happened with the former Freaks and Geeks cast not long ago when Judd Apatow and Seth Rogen started making it big, and their whole posse found their way into leading roles and big-time popularity, not to mention huge bucks for the lucky studios who found that gold mine. Maybe I’m off on this assessment, but I think some people are starting to grow weary of the “gritty reboot.” Iron Man spiced it up with the dynamic, energetic Downey, but Hulk was a downer, and I get the impression that most of the upcoming superhero movies will focus on the dark elements to cash in on The Dark Knight’s popularity. And while I think establishing high stakes is important, and a solid focus on the struggles of characters makes for compelling storytelling, I don’t want to lose the fun-ness of comics. With a comedian but gem of a talent like Glover, you have a real shot to blend the serious with the fun instead of trying to out-Nolan The Dark Knight. The comic book movie horizon has never been more crowded. With at least a dozen promising comic franchises coming to the silver screen in the next three or four years, it’ll become harder and harder for individual comic movies to command buzz they have the past three or four years. Doing something bold like casting a black Spider-Man is a surefire way to get people talking about your film. A self-avowed “black nerd,” Donald Glover has said he loves Spider-Man. He’d leave everything he has out on the celluloid, and would probably do it for a lot less than the other actors being considered, even the unknowns. From his I Am Just a Rapper mix, to underground comedy gem Mystery Team, to his clever writing on 30 Rock, to his continued excellence on Community, Glover’s projects tend to go for broke. All of his projects are passion projects, and Spider-Man would be no exception. You’d get 110%, day in and day out. So this last reason isn’t really an argument of why it would help Sony, but it would be a great side effect of the casting. The only reason The Office ever took off was because Steve Carell had a star-making turn in The 40-Year-Old Virgin, and fans hungry for more of the actor started tuning in and telling their friends how funny the show was. For the brilliant Community to survive to graduation will probably require some lucky breaks. Buzz around Glover for being cast as Spider-Man would definitely be a start. 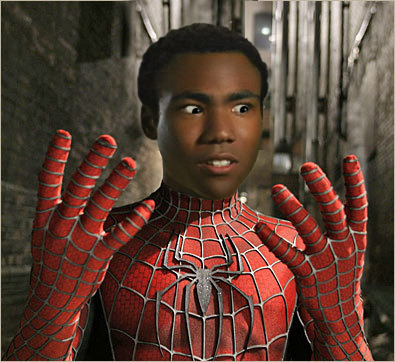 I’m not going to guarantee a Glover-starring Spider-Man movie would be great. I’m not even 100% sure he could pull off a role with that kind of emotional range; after all, he’s done almost entirely comedy. But there’s enough upside to seriously consider him. With the recent enthusiasm surrounding him and the buzz about whether Parker could be non-white, Sony would be smart to just give him an audition. In the mean time, join the Glover-approved Facebook group. Or just go watch his La Bilbioteca rap with Danny Pudi again. Hmm, a black Spidey. How about a hispanic Captain America, or an Asian Thor? While I have nothing against the concept, the character has always been, in all his decades of publishing, caucasian. Why a reboot? Because it needs one after Spidey 3. And because studios care about making money. There doesn’t need to be a justification. And those who use their own agenda as one are as mis-guided as the racism they are trying to combat. Spiderman is an established character in the American Comic multi-verse. Marvel tried to switch stuff around with their “Ultimates” series, and it failed pretty miserably. That’s why you don’t mess with a known quantity. And yes, Toby did look out of place in the action set pieces, but that doesn’t mean that someone else won’t. As for Dark Knight, you have to chalk that up to the director and the star, both of whom decided that they would continue the decidedly dark tone they had set with Batman Begins. Spiderman is about teen anget, not about dark, shadowy intensity. In his heart, Spidey is light-hearted and fun, like a piece of bubble-gum as opposed to a plate of prime rib. Completely different characters. What works for one won’t necessarily work for the other. Just give it a rest. Your main argument seems to be “he’s always been white,” which is my least favorite type of argument. Change for the sake of change isn’t a good thing, but if a change in Spider-Man’s skin color would make the character more meaningful and interesting, which I believe, and there’s no reason not to, I say why not give it a try. As for the Ultimates series, the new Spidey reboot is going to be based off of the series if I’m not mistaken, so if anything, the Ultimates mixing up the race of characters is one more reason the movie should try it. And I think we agree on the Dark Knight — I don’t want Spider-Man to try and be as dark and gritty as that film. Early word, though, is that the new film is heading that direction, which I think is a mistake. Really… you assign all of the popularity that the Office gained due to the fact that people were hungry for more of Steve Carrel, and not because of smart writing, good acting, and brilliant jokes. I’m not saying that Steve Carrel had little to do with the show’s ratings, but there’s a reason for the fact that Community is less popular than the Office. The Office is clearly better… better acting, more likeable characters, and has little of the predictability of Community, and less annoyance i might say. So my wording here might have been a little harsh and not properly credited the quality of The Office (possibly my favorite show of all time, by the way). But my point was that Carell’s popularity from the movie not only kept the show alive, but encouraged fans to tune in. Second, with regards to the discussion of the quality of Community and The Office — they really have quite different goals. I don’t think of either show as particularly predictable. They are different types of shows with different brands of comedy and different goals. I love them both.